Coffee and I have an on and off again relationship. I love it but it just doesn’t love me back. I am super sensitive to caffeine, and if I have a mug any later than breakfast I won’t be able to sleep that night. I get the jitters very easily and will become addicted (meaning I go through headache and fog withdrawal symptoms) after just a few days of drinking one mug of fully caffeinated coffee in the mornings. But because I love the aroma and ritual of a hot mug of coffee in the morning, I haven’t given it up completely. It’s just too delicious. Instead, I’ve switched to decaf. I’ll enjoy a cup of fully caffeinated coffee from time to time because I don’t want to miss out on the different flavors and experiences, but decaf is my house blend. I know decaf still has a tiny bit of caffeine in it, but since I drink 1-2 cups a day instead of 10, I’m not worried about this. And most importantly, I don’t have any of the side effects. I don’t think there’s anything unhealthy about caffeinated coffee. In fact, I wrote a paper on it during my nutrition education and concluded that having up to 2 cups per day had no effect or a slight beneficial effect on health (from antioxidants and an anti-obesity effect). On the flip side, I know several people who had terrible side effects from coffee that they thought were health problems like thyroid disorders. One friend after 10 years of drinking 2-3 cups a day gave it up and felt like he had been given a new body he felt so good. So I think there are probably more people who are sensitive to it than realize. 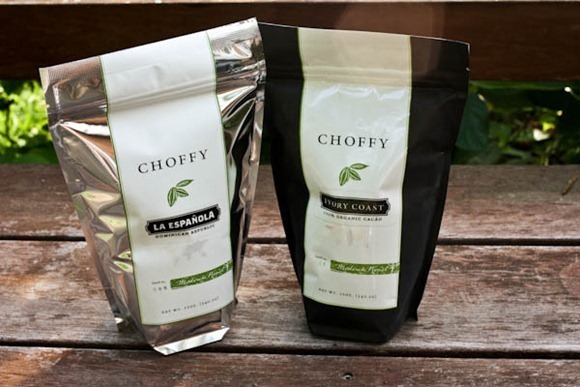 I have switched to tea and products like Choffy in the past. I like them, but they just aren’t quite as delicious to me. 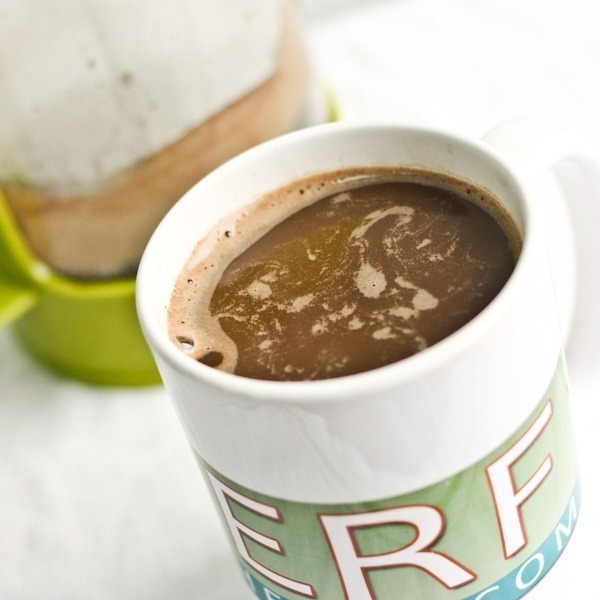 Choffy is more on the side of hot chocolate than coffee, so it’s good but for a different use. 1) It’s easily accessible to purchase regularly. This means it can’t be something I have to special order online. I like it to be something local so I can buy it freshly roasted and support a local business. I know many of you have recommended amazing decafs to me from your cities, but I just couldn’t justify all the shipping. 2) It’s decaffeinated by Swiss water process. The traditional method to strip coffee of its caffeine is by way of solvents. Some are more natural (ethyl acetate) than others (methylene chloride). But in my opinion the most natural way to decaffeinate coffee is with natural carbon or charcoal filters aka the Swiss water process. Therefore no chemicals have come in contact with the beans. I will still drink decafs that are of unknown processing when I am out, but I choose not to make them my everyday cup. The best decaf I’ve found is the Ethiopian Sidamo from Shenandoah Joe here in town, and it so happens to be Swiss water processed. Wahoo! 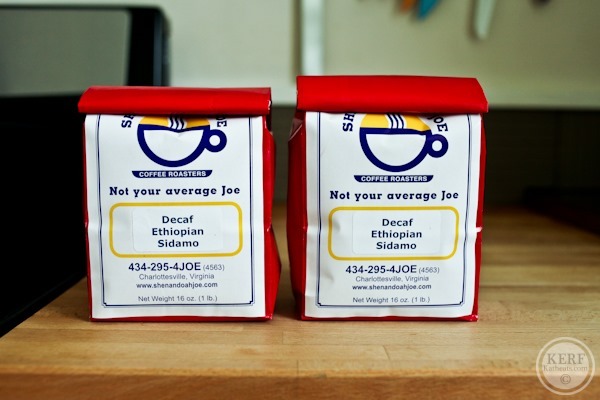 The Shenandoah Joe Organic Decaf Mexican is also a favorite of mine, and I switch between the two by season. I have another post coming up soon on all the different ways I have prepared my coffee over the years and a new coffee member of our family. Here’s a peek! I love drinking decaf coffee as well, for the taste! I have never been one to notice the withdrawal symptoms after having coffee, but I definitely notice if I have 2 cups of caffeinated coffee or tea in the morning and feel jittery. Decaf still lets me enjoy the steamy cup! Yay! I have one cup of coffee and one diet coke each day. Every now and then I’ll have a second serving but I try not to make it a habit. And I’m aware diet coke isn’t the best choice ever, but I like it. I should definitely start I cut back on my intake I gave terrible acid reflux! that sky blue mug is so cute! that little sky blue mug is too cute! I’ve become an addict. If I don’t get my two cups in the morning, the head pounding begins. Kath, you mentioned teas, what are your favor kinds/brands? How do you prefer it prepared? I found a new tea by Tazo called ‘Focus’ that is delicious! I’d recommend trying it. Also, green tea is one of my favorite teas along with the two you mentioned, Kath. 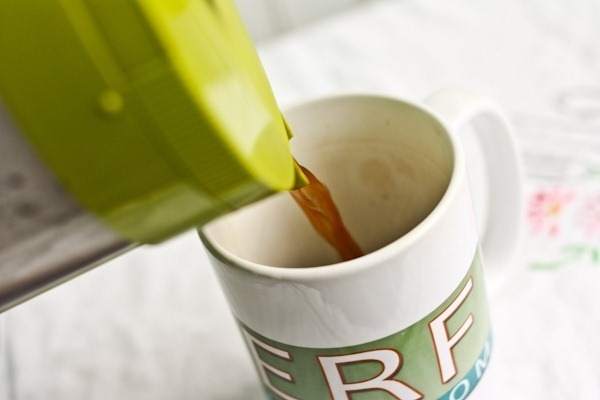 Have you found a good way of grinding and brewing your own coffee in your Keurig? Sadly, I have been forced to rely on the K-cups because I have tried using the Solo cup to no avail. I ground fresh coffee, filled the Solo cup, and attempted to make a mug of coffee on several occasions, but the flavor is awful, and a lot of the grounds seep through the screen. Any tips or product suggestions? Thanks! I have been using the Solofill cup that comes with the Vue and find it to be very good. I wonder if it’s the K-cup verses the V-cup machines? I think the Vue has a bigger cup size = stronger coffee. Hmm that could be it. It’s just that I’ve tried it several times & with different coffee, & it fails to brew a good cup of Joe. Any tips on how much grounds you add to your Solofill? I’d really like to make it work! I don’t like the Solo cup for the Keurig either. My coffee tastes watered down when I use it but it’s killing me spending over $1 for each k cup! Whoo Hoo. Keuring to your rescue. I love mine for coffee and tea. I recall asking you if you had one a couple years back & you said no. Enjoy!! i ebb and flow as well; lately about 1-2 cups a day. But you’re right, caffeine does have an effect on well being. I am always interested to see how caffeine affects me. I love having my cup of coffee in the morning. I think it is a ritual thing as well and it is just so tasty. I do take a few non-coffee days every once in a while to be sure that I am not getting addicted to it. I am so picky about my coffee and have not found one quite yet that I absolutely love. I wish I could quit you, Joe, but I will forever be a slave to my dark master…….and I like it! I don’t like the taste of coffee so I’ve never become a coffee drinker. That is so interesting about the process to making coffee decaf, I had no idea it was done that way! Haha I’m the opposite – I don’t think the caffeine in coffee effects me very much! I guess after a summer of Bar exam studying and drinking insane amounts of coffee I’ve become immune… Although I’m sure if I drank it too late in the day it would interrupt my sleep! I hear ya. I’m extremely sensitive to caffeine and also experience withdrawal after only a short period of drinking high-test coffee; multiple week-long European vacations have confirmed this! 😛 You might like to try decaf chicory coffee. (This goes for the person with the acid reflux, too.) It’s milder, flavorful and makes great espresso, too! Yum, I love coffee.. I feel like you’re the only person who can make a mug of coffee look so delicious in a photograph, too haha. It’s amazing how caffeine can seem to have such a different effect on different people! I usually drink regular coffee so I had never really looked into the processing to make decaf coffee. That is interesting to know! 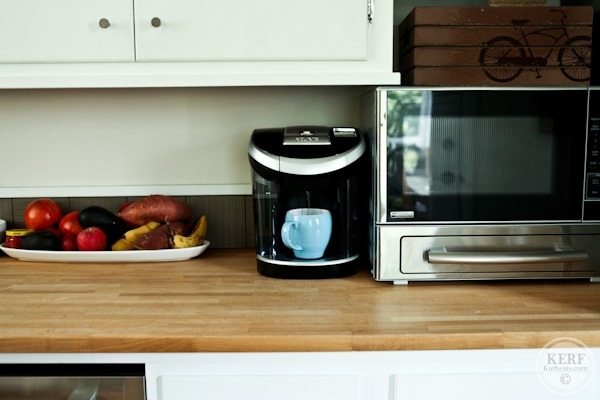 That looks an awful lot like the Keurig Vue! I have a Keurig Vue and it’s my favorite thing! I love being able to change the temperature, strength, and volume. I’m not caffeine sensitive in the least. In fact I usually end up drinking a cup around 10 or 11 pm to keep me up to study (I know, it’s terrible) and I can fall asleep at midnight. Probably due more to exhaustion than a super human tolerance 🙂 I hope it’s treating you well though! I’m also really interested in trying choffy! My stomach has become sensitive to the acidity of coffee, so I usually stick with one cup of regular in the morning. I can’t see any reason to drink decaf; if I want the ritual, I’m all about herbal teas, but only loose leaf. Luckily, my mom’s in the tea biz and hooks me up with delicious teas. I gave up coffee back in March. I only drank a mug and a half each morning but I am very sensitive to caffeine and thought it might be better for me to get off it all together. It was so easy to give up and I never looked back. In it’s place I enjoy decaf teas and love the variety of flavors they have to offer. Oh I love my coffee in the morning! I can usually only do 16 oz (one travel mug) otherwise I get jittery. Have you tried David’s Tea company? My Canadian cousins got me to try it, the website has the most delicious descriptions, make me drool just thinking about it! Caffeine doesn’t affect me that way either. My husband, on the other hand, gets the full benefit and feels very productive in the few hours after drinking it, but then suffers a crash in the early afternoon. So he gave it up. Sorry for him. I don’t drink it for the ‘buzz’, but because my one iced coffee a day is my favorite part of breakfast. I am a decaf drinker too. I gave up caffeine 4 years ago when going through IVF and felt so much better off the caffeine that I never went back. I find I can tolerate the smaller amount that is in decaf coffee and in some black and green teas. My body also processes caffeine with extreme efficiency and I cannot drink coffee past 10am or I don’t sleep at night. If I even drink regular coffee my heart stays accelerated the entire day, it is crazy. I have been drinking DandyBlend for a couple years now and I love it!! Have you tried dandy blend Kath? I just got a sample of choffy to try, but this one does have caffeine right?! No I don’t think Choffey does? It does have a little as it is made of cocoa beans which naturally have caffeine in it. Not as much as coffee, but does have some. This post really got my attention too because I’m also breast-feeding and have been drinking decaff since I was pregnant. I’m totally mentally addicted to coffee, my decaff in the morning really gets me up and going! My midwife and the lactation consultant say that a little caffeine is ok and I do have the occasional half-caff to perk me up but I would love to know if there’s any real research on caffeine and breast fed babies. PS I rarely post but I read your blog all the time, love it! Also a huge BERF fan, I went back and followed your pregnancy week by week while I was pregnant. Thank you so much! I think you read that incorrectly. Kath stated that the person was having such serious side effects that he thought he was having a serious medical condition like a thyroid disorder. However, I do not think she stated that caffeinated coffee played any role in thyroid function. I could not have said it better myself. I feel exactly the same about coffee – I’m so sensitive to its effects but I love it so gosh darn much! Decaf beans tend not to do as well in the espresso machine (which is what we use at home) but I’m on a mission to find some that will pull a good shot! As a graduate student I get a little too addicted to caffeine sometimes but you’re right, not drinking it all the time makes me feel so much better suprisingly! I love our handy expresso machine but I have to say my favourite way to drink coffee is with a Moka Coffee maker…two espressos a day, homemade, Lavazza coffee! Heaven! I don’t know the answer to that…I’m sorry!